Groupon has a $15 Jamba Juice eGift Card for $10, Free Shipping. 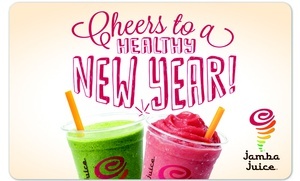 Valid at any participating U.S. Jamba Juice location. Jamba eGifts not valid at Airport, Safeway, Target, University or Hospital Locations. JambaCard does not expire. Promo codes not valid toward this offer.